Reviewed by Amanda Lautieri, B.A. What Does Heroin Withdrawal Look Like? Medical detox providers use medications and therapy to soothe symptoms, boosting the chances that a person will move through withdrawal safely and successfully. As prescription painkillers become harder to divert, obtain, and alter, many people addicted to opiates are turning to heroin as the answer. The Centers for Disease Control and Prevention (CDC) reports that heroin abuse has doubled for Americans aged 18-25 in the past decade. In 2013, approximately 8,200 people died from a heroin overdose, which is close to four times the number of heroin-related overdose fatalities in 2002. Heroin is highly addictive. Due to its powerful withdrawal symptoms, those who are dependent on heroin may fare better in medical detox in order. Heroin withdrawal will not be the same for everyone. The longer someone uses heroin, how it was abused, and how much was taken each time will all be factors in how dependent the brain and body are to the drug. Therefore, the severity and duration of withdrawal will vary as well. Someone with a history of mental illness or previous opioid withdrawal may have a more intense withdrawal experience. Heroin is an opiate drug that suppresses some of the functions of the central nervous system, like heart rate, blood pressure, respiration, and temperature regulation. It also binds to opioid receptors, increasing chemicals in the brain that are responsible for feelings of pleasure. When heroin is abused, a rush of pleasure also occurs. During withdrawal, the effects are the opposite of the intoxicating effects. For example, instead of euphoria, reduced heart rate, and sedation, the individual may experience low mood, anxiety, and rapid heart rate, among other symptoms (see below). Withdrawal symptoms range in severity in accordance with the level of dependence and duration of abuse. For someone who didn’t abuse heroin in massive doses for months or years, withdrawal may be more tempered and not last as long. Withdrawal from heroin isn’t generally considered life-threatening on its own; however, some of the medical and psychological symptoms may have complications that may be life-threatening. Depression may lead someone to consider suicide, for example. Heroin should never be stopped suddenly without the support of medical and/or mental health professionals who can employ multiple methods for managing the side effects of withdrawal and keep individuals safe. Heroin is a short-acting opioid, meaning that it takes effect rapidly but also leaves the bloodstream quickly. The National Highway Traffic Safety Administration (NHTSA) estimates that heroin withdrawal symptoms start within 6-12 hours of the last dose, peak in 2-3 days, and last 5-10 days in total. Detox is the set of interventions used to manage the symptoms of withdrawal. Since withdrawal can peak after a few days of the last dose, detox in a substance abuse treatment center that offers medical detox may be the most comfortable way to withdraw from heroin. Medical detox often starts before heroin completely leaves the system and usually takes between 5 and 7 days. For someone who is more heavily dependent on heroin, detox may last a little longer, up to 10 days. Medical detox often incorporates medications and therapy to help the body and brain recover from its dependence on heroin. Blood pressure, heart rate, breathing, and temperature levels are all monitored to help keep individuals safe and secure throughout the entire process. The American Society of Addiction Medicine (ASAM) estimates that 517,000 Americans battle heroin addiction. Heroin is classified as a Schedule I drug by the Drug Enforcement Administration (DEA), which means that it is considered to have a high rate of abuse and potential for addiction, and no medicinal uses in this country. There are several medications approved to treat heroin dependency, some of which may be used during detox to control the more uncomfortable physical and emotional withdrawal side effects, as well as to keep cravings to a minimum. Ideally, this process is undertaken at a professional heroin detox center. Heroin may be replaced with a longer-acting opioid to relieve withdrawal symptoms and drug cravings, and adjunct medications may also be used to treat specific symptoms. Anti-nausea medications, antidepressants, and anticonvulsants are some examples of symptom-specific medications. During medical detox, mental health professionals are also on hand to offer support and assistance. The National Alliance on Mental Illness (NAMI) reports that about half of all drug abusers also suffer from mental illness, which can also affect duration and treatment methods during the stay at a heroin detox program as well as throughout substance abuse recovery. Emotional withdrawal symptoms related to heroin, such as depression and anxiety, may be more prevalent in someone who also has a history of mental illness or an underlying mood disorder. When heroin stops being active in the bloodstream, individuals may notice a dip in dopamine levels, which can result in a “crash” of emotions. Not only do vital signs and anxiety levels spike, normal things that used to induce pleasure no longer bring the same joy. Being in a supportive and calming environment during the peak of these symptoms can help someone get through the process more easily. As a general practice, individuals who receive rehab treatment will undergo medical detox and then intensive therapy treatment. 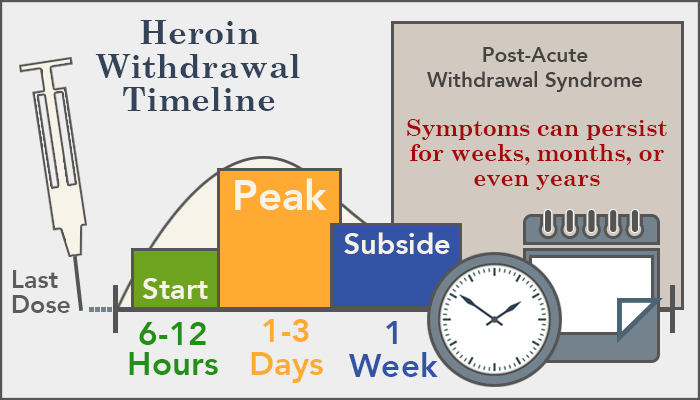 Heroin and other opioids are unique in that there are prescription medications available to assist with both withdrawal and abstinence maintenance. In the case of heroin, a person in recovery may be treated with buprenorphine (Suboxone), methadone, or naltrexone. Each medication can have different introduction times but all will require either an in-clinic visit or a prescription for at-home use. This particular discussion focuses on heroin withdrawal and Suboxone. 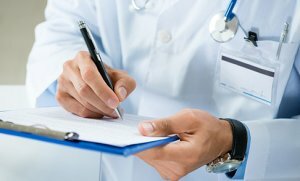 As PsychCentral discusses, the U.S. Food and Drug administration approved buprenorphine for the use of opioid withdrawal and as a maintenance therapy. In terms of the withdrawal process, these medications are regarded for their ability to suppress symptoms, including cravings. In this way, buprenorphine serves as a relapse prevention measure. Further, when used as a form of abstinence maintenance therapy, buprenorphine has a lower potential for abuse compared to methadone. Some studies report one-year sobriety rates for those on buprenorphine to be between 40 and 60 percent. But buprenorphine, particularly Suboxone, is also sometimes used for a separate purpose than its intended use. Some heroin abusers purchase Suboxone on the street to use recreationally. These individuals use Suboxone to stave off painful or uncomfortable withdrawal symptoms in between heroin uses. The Suboxone often comes from individuals who have lawful prescriptions and choose to sell the pills. Some individuals who use Suboxone between heroin doses may do so as a way of “chipping,”which is slang for using heroin recreationally without becoming clinically addicted. Chipping, by way of Suboxone use or not, is a highly dangerous behavior and can lead to physical dependence and then addiction. Methadone has long been used for the treatment of heroin addiction. It is a long-acting opioid that is substituted for the shorter-acting drug. Methadone stays active in the bloodstream for an entire day in most cases. Methadone works to minimize heroin withdrawal by activating the opioid receptors in much the same way as the drug itself, although with less of the intense and rapid onset of euphoria that heroin produces. Methadone is federally regulated and usually given out as a pill once a day. Methadone doses can be gradually tapered down over time. Methadone does still have the potential for creating dependency on it as well, especially if it is abused and taken in higher than intended doses. Other options and medications may be preferable for many individuals. Another product that is also a partial opioid agonist and long-acting opioid is buprenorphine. Buprenorphine has the added bonus over methadone of reaching a plateau after a certain amount is taken, thereby reducing its abuse potential. Naloxone may also be added to buprenorphine products to keep users from wanting to take more heroin for fear of the onset of withdrawal symptoms when the drug is injected. Naltrexone is an opioid antagonist that blocks opioid receptors and can be used for the long-term maintenance of heroin abstinence. Individuals should be very clear with their drug use history and disclose the correct information about the last dose in order to avoid precipitated withdrawal during detox. If someone takes an active opioid antagonist drug while an opioid agonist, such as heroin, is still in the bloodstream, withdrawal symptoms may be more dangerous and may start suddenly, which is called precipitated withdrawal. This can be avoided by a drug assessment done upon entering detox. Medical detox can provide a controlled environment that can help prevent any other drug abuse as well. Medical detox functions optimally as a part of a comprehensive opioid dependency treatment program that will also include further support and services.